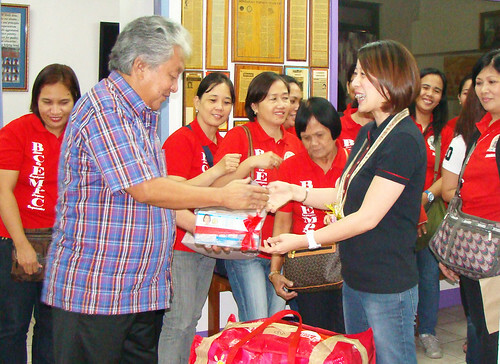 Two months has passed after deadly tropical cyclone Sendong struck Cagayan de Oro City, and yet, financial aid and relief goods of local government units (LGUs) from various parts of the Philippines still keep pouring in with love. Lately, Toledo City Government of Cebu donated P 500,000.00 in check, personally handed by its Mayor Aurelio P. Espinosa to City Mayor Vicente “Dongkoy” Y. Emano . Manila Mayor Fred Lim also donated P1 million and Speaker Sonny Belmonte gave P500,000. Masbate Governor Rizalina L. Seachon Lanete sent her representatives to handover P 250,000 donations from their province. From the City of Biñan, its City Mayor Marlyn ‘Len-len’ Alonte-Naguiat came together with her team and also donated P266,632.00. The League of Provinces of the Philippines and Governor Orlando A. Fua Jr. of Siquijor even donated some P125,000.00 and P500,000 in checks, respectively. Total financial aid received by the City Government have now reached P P68,409,317.82. Another LGU came up with a different, but smart, way to help CDO. 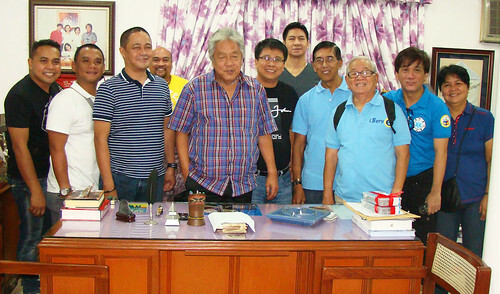 Pasig City Team led by Pasig DILG chief Jay E. Timbreza and Pasig Liga President Ferdinand A. Avis also visited the city last February 16,2012. Their team introduced and discussed with Mayor Emano Pasig’s existing Disaster Risk Reduction and Management System (DRRM) – a DRRM action plan adopted shortly after their city was hit by typhoon Ondoy. Accordingly, they have now remained assured and disaster-resilient especially when it comes to flooding. The Philippine archipelago locates in the Pacific Ring of Fire and is situated along a Typhoon Belt. Due to its geographical set-up, natural hazards abound in the archipelago- tropical cyclones, floods, earthquakes, volcanic eruptions among others. Flooding and tropical cyclones are the ones most prevalent. An average of 20 cyclones visit our country every year. Like many other places in our archipelago, the City of Golden Friendship is also prone to natural hazards. Its citizens’ experience of the devastation of Sendong attests to this. Yet, despite this great threat from nature, every LGU must, all the more, rise up to the challenge and muster its responsibility to build adaptive and resilient communities especially in the face of global climate change. A real challenge that the CDO City Government, its people, local and foreign partners involved in the comprehensive rehabilitation work for Sendong survivors had stood up to. For more than two months now, the city government, through the leadership of City Mayor “Dongkoy” Y. Emano, together with its donor partners, have focused its efforts in the completion of building permanent houses in the city’s relocation sites. A target of 1,000 concrete houses is to be completed by April 2012. All financial aids from partner LGUs have contributed and made possible the rise of adaptive, disaster resilient new communities for Sendong survivors. The permanent relocation that the city government is giving to thousands of homeless families means a new community will very soon rise in Calaanan, Canitoan in this city . This new community which the Sendong victims will soon comprise, however, is not comparable to the evacuation centers where the beneficiaries have become so dependent on relief goods, food and other assistance delivered by concerned sectors, but will be an ideal community worthy of emulation. The house-and-lots at the permanent relocation in Calaanan, according to Mayor Vicente ‘Dongkoy’ Y. Emano, are not ‘dole outs’ but are freely given to each beneficiary. They will be the occupants of these houses forever through certificates of award which the city government will issue. As with all other pro-poor programs of Mayor Emano, particularly the ‘Singkwenta-Singkwenta Program’, the Estate Management Division (EMD) is the department that would be most involved in the supervision, monitoring, and management of the new community composed of typhoon Sendong victims. EMD staff Rubina Castro, project-in-charge of the Calaanan Relocation, clarified that the city government, together with various government agencies, shall provide the necessary assistance in the form of livelihood projects for the beneficiaries. “They will be taught in the field of livelihood. We will be profiling these folks so we can mark their skills and help them find jobs that best fit their skill levels,” said Castro. Castor further added that the EMD shall conduct an initiative which include regular communication with the beneficiaries, strengthening of their spiritual convictions, and organizing them through the so called Community-Based Structure (CBS) where leaders shall be picked right from within their community. The community will be put under the jurisdiction of the barangay council of Canitoan and will be encompassed by the rules and policies of the same barangay. All in all, the 63 hectare lot acquired by the city government in Calaanan, intended for the “Land for the Poorest of the Poor Program” of the Emano administration, has taken on a nobler status inasmuch as it has not only addressed the problems of the victims of demolition and conflagration calamities, but has also served as an instrument to help the victims of the typhoon Sendong rise and get back on their feet. All those who have been settled in Tent Cities 1, 2, 3, and 4 in Calaanan may not necessarily be given priority automatically for the permanent shelters that will be provided by the city government. Before the final turn-over of the permanent relocation units, all those who are now in the temporary shelters will again undergo a final verification and validation by the Estate Management Division (EMD) and City Social Welfare and Development (CSWD). Like the initial process of picking the beneficiaries for the temporary shelters, the structure owners (as opposed to renters) will be given priority for the occupancy of the permanent relocation units through ‘raffle’. If there had been ‘renters’ who got through and were given temporary shelters earlier perhaps via questionable means, the EMD will now ensure that it will never happen again during the distribution of the permanent homes. “All those who were affected by the typhoon should not worry because everyone will be given permanent homes,” Mayor Emano assured all Sendong-affected citizens. The City Government’s permanent relocation is located in Phase 3 within the 63 hectare land alloted for Mayor Emano’s pro-poor Piso-Piso program (now Singkwenta-Singkwenta). From this 63 hectares, the Mayor has set aside 9 hectares for the relocation of the typhoon Sendong victims. Back in 1998, this 63 hectare lot in Calaanan was bought by the city through Mayor Emano in the amount of P101,536,800.00 in accordance with City Ordinance Number 6647-98. The lot which the Mayor allocated for his pro-poor projects has macadam surface pavement roads, open CHB-lined drainages system canals, individual septic tanks in Phase 1, level III water connection through the Cagayan de Oro Water District (COWD), individual electrical connection serviced by the Misamis Oriental Rural Electric Services Cooperative (MORESCO) and has community facilities such as open spaces for parks and playgrounds, day care center, community stage and covered court, Kalahi Training Center, PUJ terminal and mini-market. Presently, the 9-hectare Sendong relocation in Phase 3 already has 8 completed quadruplex houses constructed by the Oro Habitat for Humanity and more or less 15 other quadruplex structures laid out. Each quadruplex unit accommodates 4 family-beneficiaries. Habitat for Humanity pointed out that the 300 houses may be completed within 3 months. The City Mayor estimated that there will be more than enough houses because aside from the 1,750 houses the Habitat is building and the 500 houses by the local government, the Filipino-Chinese Community will be donating 1,500 houses where 300 of these shall be initially constructed soon. The business tycoon Lucio Tan has also pledged to build 600 houses, and more generous parties are giving their pledges to the mayor. In spite of issues about possible dangers or that the area has geo-hazards because it is surrounded by 3 creeks, Mayor Emano clarified that some national officials expressed favorable impressions about the relocation area after being inspected by Vice President Jejomar Binay, DSWD Secretary Dinky Soliman, DILG Secretary Jesse Robredo, DPWH Secretary Rogelio Singson, among others. “They like our relocation site. DPWH Secretary Singson assured that the banks of the creeks near the site will be rip-rapped and a bridge will be built there,” the mayor said. The permanent relocation site in Calaanan is 8 kilometers southwest of the city proper and easily accessible through fully concreted roads. PUJ fare from Cogon is P14, P12 from Divisoria, and P10 from Carment, vice versa. The year 2000 saw the creation and rise of the Comprehensive Socialized Housing Program for the Underprivileged and Homeless Citizens of Cagayan de Oro, a program of Mayor Emano more popularly known as Piso-Piso Program, centered around the 67-hectare off-site resettlement in Calaanan, Canitoan. Up to the present, the development and progress of the Calaanan community, where the Oro Habitat and Piso-Piso are located, continues under the able supervision of the city government. But in December 17, 2011, Cagayan de Oro City was struck by the unsparing typhoon Sendong. More than a thousand perished and were missing and thousands of families were rendered homeless. President Benigno Aquino III, during his visit in the city last December 20, 2011, declared Isla de Oro, Consolacion, and Cala-cala, Macasandig as ‘danger zones’ and ordered that residents of these places be not allowed to settle back. This presented a dilemma to Mayor Emano inasmuch as the relocation of an overwhelming number of families is no easy task. The victims called and requested Mayor Emano to allow them to return to their homes because of the inconvenience they experienced in the evacuation centers. But the President’s order is absolute and cannot be violated. “I humbly ask for your forgiveness, that I could not favorably respond to your request. I could not grant your wishes as it would go against the orders of the President. It is beyond my power now,” the mayor stated. It is at this point that Mayor Emano decided to utilize the remaining area of the city’s property in Calaanan as relocation area. The Calaanan relocation which was then the center of the Piso-Piso Program (renamed Singkwenta-Singkwenta) has, this time, likewise become the center for the relocation of the victims of the typhoon Sendong. On December 27, the installation of 365 temporary shelters donated by Shelter Box in Tent City 1 and another 120 tents donated by DSWD was completed. This was in Phase 2 within the 67 hectare relocation site established by the Emano administration. Tent City 1 was able to accommodate 393 families (1,862 individuals) after a very meticulous evaluation and validation conducted by the EMD and DSWD. Those who were house owners and actual occupants (not absentee owners or renters) whose houses were washed out were given priority and thus were the first ones given access to the tents. Mayor Emano however reminded everyone not to worry as every affected family will eventually be given their own shelter. The beneficiaries who were settled at the temporary relocation received constant and regular aid from the city government, DSWD, non-governmental organizations, private companies, various local government units, and other concerned sectors of society. Also installed within the Tent City are function halls, water facilities, baths, laundry areas, comfort rooms, and street lights. The Barangay Council of Canitoan helped out by maintaining peace and order in the Tent Cities through the imposition of curfew hours where everyone, especially the youth, are allowed only to stay out until 10:00 pm in the evening. The Barangay Police of Canitoan implemented and contributed much to this affair. As of this writing, 726 temporary shelters have already been installed in the three (3) Tent Cities. The City Government is continuing the process of transferring additional Sendong-affected families into the vacant (119) tents in Tent City 2 and Tent City 3. Since February 2 to February 6, a total of 96 families have been successfully moved to Tent City 2. Most of these relocated families were evacuees from the West City Central School in Carmen, who were given priority to occupy the 215 available temporary shelters. The authorities at EMD (Estate Management Division) clarified that there was a little delay in the transfer of the families due to the meticulous evaluation and validation for every beneficiary. This is to ensure that those who are prioritized can be relocated accordingly. The evaluation and validation, it was known, was strictly implemented by the Department of Social Welfare and Development (DSWD), City Social Welfare and Development (CSWD), Estate Management Division (EMD), National Housing Authority (NHA), and Xavier University. There is yet no set date for the completion of the relocation of evacuees to their temporary shelters as this will depend on the outcome of the ongoing evaluation and validation process. The Tent Cities will henceforth serve as temporary relocation while the victims await for their permanent homes now being constructed by the Habitat For Humanity at Phase 3. The lots that the city government acquired and which are now utilized as relocation sites has become a boon not only for the urban poor but also for the victims of the typhoon Sendong. This is what Mayor Vicente Y. Emano expressed as he thanked everyone who has helped bring back the affected families to its feet after the calamity last December 17, 2011. He thanked the various government agencies, local government units all over the nation, private corporations and individuals, non government organizations and friends who sent donations, both big and small, cash and relief goods. The mayor did not forget to thank the past administration of the city for the foresight of buying lots which now became the relocation sites, in Calaanan, Canitoan, for the Sendong affected families. “I thank ex-Mayor Pablo Magtajas because the lots which he acquired for the city government during his time came in handy in our current circumstances,” said Mayor Emano. During Magtajas administration, the city government acquired 27 hectares of land in sitio Calaanan. These include 4 lots in all valued at P4.1 million pesos. In 1998, a few months after Emano took office as city mayor, at total of 63 hectares was acquired by his administration at P101.5 million pesos. This land became the centerpiece of his Off-Site Resettlement Program or Piso-Piso Land Program for the Poor which greatly benefitted the city’s less fortunate citizenry. Of the 63 hectares, only 25 hectares was developed under the Resettlement and Socialized Housing Project of Mayor Emano. It is here where the 213 housing units of the Oro Habitat for Humanity were erected; 462 beneficiary families were relocated in Phase 1 of the Piso-Piso program; 640 families in Phase 3; 31 families in Phase 4 Village of Hope; and 65 families under the classification Persons With Disabilities in Phase 2. The selection of beneficiaries for the relocation to Calaanan underwent a meticulous evaluation and verification process undertaken by the Estate Management Division (EMD) spearheaded by Ms. Virginia Diguinion. According to Diguinion, beneficiaries qualified for relocation to Calaanan are those families which are classified as ‘squatters’ or members of community associations affected by demolitions; squatter families which are victims of fire and squatter families which have been affected by the city government’s infrastructure projects. Within this relocation site, Mayor Emano has also included a special housing project which include members of the Cagayan de Oro City Police Office (COCPO), Cagayan de Oro Fire Station (COFS), and enlisted personnel of the 4th Infantry Division of the Philippine Army, with lower positions/ranks and receiving meager monthly salaries. The community which now bloomed in Calaanan is under the supervision of the city government where every beneficiary family abides by the by-laws and policies implemented by the EMD. This includes a strictly implemented policy where the certificate of ownership cannot be transferred, given, or sold except when it is passed to the children of the beneficiary. The EMD also organized a community-based structure where every block elects a leader and all block leaders in turn elect their federation officers and board of directors. In Calaanan, there are 6 officials and 9 board of directors. Each director handles a committee that addresses the needs of their community such as the committee for women, youth, peace and order, livelihood, and others. According to Rubina Castro, EMD project-in-charge in Calaanan Relocation, the community is carrying on smoothly with the present setup. This community is no different compared to other communities outside the relocation where in spite of the differences in points of view and ideologies, they move on with the good of the community always in the forefront, and accomplishing their goals through unity among their leaders and members, motivated by the constant support of the local government. Soon, thousands of families will soon join this same community in Calaanan, Canitoan, Cagayan de Oro City.